NerdWallet has compiled the top 5 states in the US for residential solar energy, according to four specific criteria. Top of the pile was California, thanks to a sunny location, the pioneering of solar leasing, and great cash-back incentives. Filling out the top 5 were Hawaii, Arizona, Maryland, and Delaware. NerdWallet explained that they wanted to “combine the most recent and accurate data available to give homeowners a comprehensive look at key factors to consider when pondering the switch.” They then “compiled and quantified this key information as a guide for gauging solar advantages” in an individual’s own state. California’s electricity costs are among the most expensive in the country. The state has set the loftiest goal of deriving 33% of electricity from renewable sources by 2020. This high goal encourages generous rebates from utilities to help cover the cost of installation in addition to cash back incentives once the system is in use given support from the California Solar Initiative. After installation, residents also are exempt from paying state property taxes. Cities and municipalities provide even more incentives: in San Francisco cash back incentives range from $2,000 to up to $10,000 depending on household income. As for weather, the state gets great sun which means you’ll be able to rely on your system to generate power all year-round (and get paid for selling surplus energy back to the grid). Californians also pioneered solar leasing. Hawaii almost has it all. As one would expect, the sun shines brightly over the islands given their proximity to the equator. It also has the most expensive electricity costs (36 cents per kilowatt hour). The combination of these factors suggests Hawaiians could save a great deal by switching to solar. Currently, Hawaiians installing PV solar panels can receive a 35% state tax credit (35% of the installation costs or a $5,000 credit) in addition to the national 30% personal tax credit, but no rebates or grants are in place to offset immediate installation costs. Solar leasing is available in Hawaii. 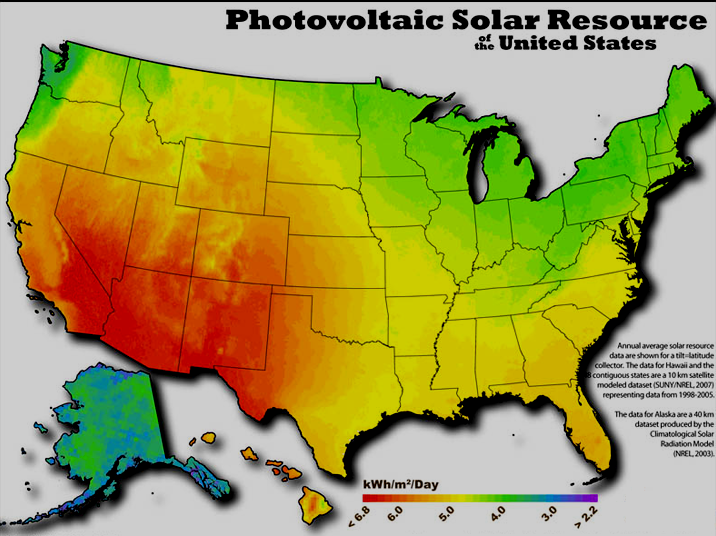 Right behind Hawaii, Arizona has the second best insolation rating in the country, and combined with relatively high consumption, Arizonians can easily save by switching to solar. The state offers generous rebates based on residents’ local utility, with many providing up to 50% of installation costs. These rebates are combined with a 25% tax credit (capped at $1,000) that is applied to residents’ income taxes. On top of these incentives are state property and sales tax exemptions. Solar leasing is available in Arizona. Maryland aims for 20% of all the energy generated by 2022 to come from renewable sources. Because of this standard, utilities and the state government are offering great incentives. For almost all smaller residential installations, homeowners qualify for a $1,000 grant. Additionally, they receive cash back from the local utility for every kilowatt they produce with their panels on top of state property and sales tax exemptions. Great state regulation means, despite Maryland’s mid-range electricity costs and below-average insolation, homeowners here can typically pay off the cost of installation in 8 years, the same time frame projected for Arizona residents. Solar leasing is available in Maryland. Similar to its neighbor, Delaware has the goal of generating 25% of energy using renewable sources by 2025-2026. Also like Maryland, the local utility will pay homeowners for the electricity generated from residential PV panels. The state offers installation rebates that are tiered by the size of your system: for the first 5 kilowatts homeowners can receive $1,250 per kilowatt and $750 for the next 5. On average, the system should pay for itself in 5 years. Solar leasing is also available.